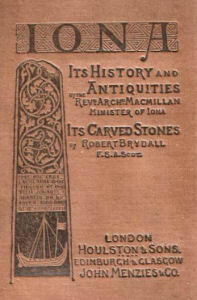 Above is the cover of a small book printed in 1898, containing some fine line-drawings of just a few of the many wonderful carved stones of Iona. The latter have been a source of inspiration and awe to visitors of the island for centuries – and they had a profound influence on the unique work of Alexander and Euphemia Ritchie. On the cover of the above book is shown a sketch of the lesser-known MacKinnon’s cross shaft, which bears a Latin inscription translating as "This is the cross of Lachlan MacKinnon and his son John, Abbot of Hy (the old name for Iona), made in the Year of Our Lord 1489." For centuries the cross shaft leant against the inner wall of the roofless St Oran’s Chapel, until during the 20th century it was moved into the island’s museum. 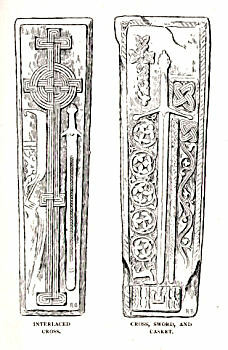 The Ritchies used both the galley and the ornate foliate decoration on this cross shaft in many different ways as part of their Iona craftwork and jewellery. Large brass items such as firescreens, plaques, mirrors, and ornamental dishes were just some of the wonderful items made by them during the first decades of the 20th century. 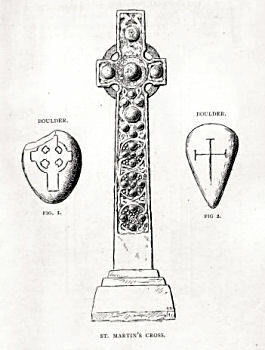 Victorian sketch of St Martin's Cross, Iona, with two smaller carved/incised 'boulder crosses' on either side. 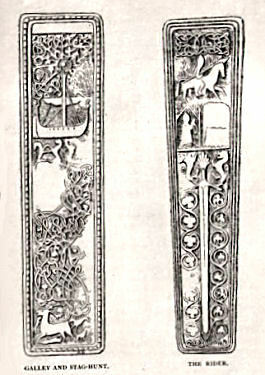 The cross on the left goes by the legendary name of St Columba's Pillow, and its design was used by Alexander Ritchie on various items of his silverwork (see also the small silver cross at the beginning of the section on the CAI on this website). 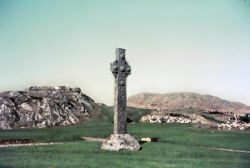 The cross itself is said to date from the 8th century. This is a fine but damaged stone carving of just over 4ft in height, depicting the effigy of Prioress Anna of Iona. 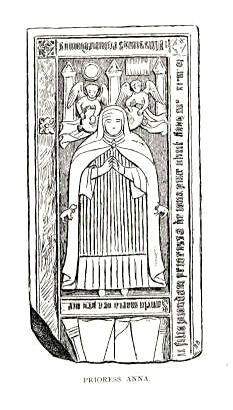 The well-known artist and engraver Pennant (see one of his engravings on the Early Iona Pictures section of this website) when visiting the island in 1772 described the original stone as being complete, and the now almost-missing inverted figure below Prioress Anna was described by him as showing "..the form of the Virgin Mary, with head crowned and mitred, the child in her arms, and, to denote The Queen of Heaven, a sun and moon appear above her." The remaining Latin inscription translates as "Here lies the Lady Anna (daughter) of Donald McTearlach, formerly Prioress of Iona, who died in the year 1543, and whose soul we commend to The Most High." The Ritchies incorporated the design of Prioress Anna into a fine silver brooch in the shape of an equi-armed celtic cross (see example in the Shield Brooches section of this website). 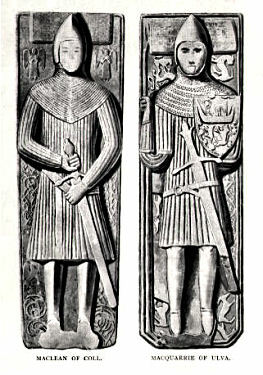 Ancient carved stones showing knotwork, foliate designs, and medieval Scottish swords - all strong influences in Alexander Ritchie's work (see the Brooches section on this website and Sword Brooches page. Click here for more information on the ancient carved stones of Iona, and the pioneering work of the Victorian artist/archaeologist James Drummond.